BARRETO TRENCHER 4" X 18"
Front Wheel to Handlebar: 71"
Boom End to Handlebar: 81"
Sometimes the job demands a more compact approach without sacrificing production speed. To meet the needs of the residential contractor who may be working in tight spaces, this self-propelled trencher can easily handle sprinkler systems, electrical lines, and other shallow trench applications. The 912 saves on space while still providing the horsepower necessary to trench up to 24 deep. The boom pivot design keeps high wear components out of the dirt and is easily maintained. The front end pivots on a pin instead of a boom pivot bushing. This reduces maintenance issues often caused by dirt and debris. The control panel is simple and understandable for even the novice operator. The safety clutch engages and disengages the wheel and chain drives. When the clutch is released, the engine continues to run and the controls remain in place, ready to resume trenching at any time. 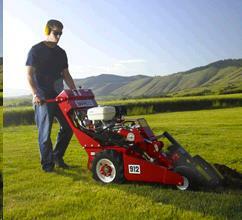 Variable speed drive allows the operator to adjust their wheel speed to the soil conditions. The reversible chain drive can be operated manually to dislodge obstructions or debris. 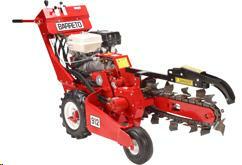 * Please call us for any questions on our barreto trencher 4 inch x 18 inch rentals in Santa Ana and Orange CA.